Hello everyone, Today I'm over the brand new Tonic Studios Blog here. This was our first-week blogging and you can find more inspiration using your favourite Tonic products over there. I hope you can pay us a visit. 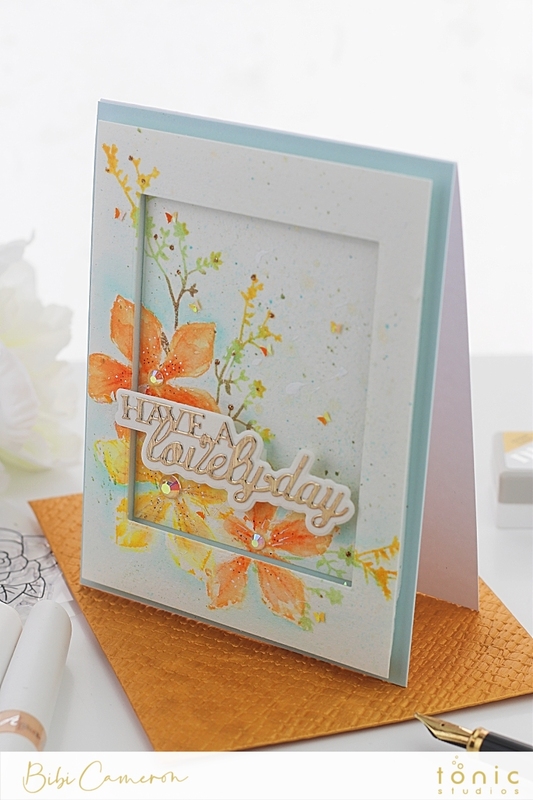 I made a C6 standard American size ( 4-1/4 x 5-1/2) card using a Magnificent Magnolia Stamp set, Nuvo Aqua Flow Pens and other supplies from the new Tonic's colour collection called Woodland Walk. This new colour collection was released today in the Tonic Studios USA Shop and it will be available soon on the Tonic Studios UK shop. 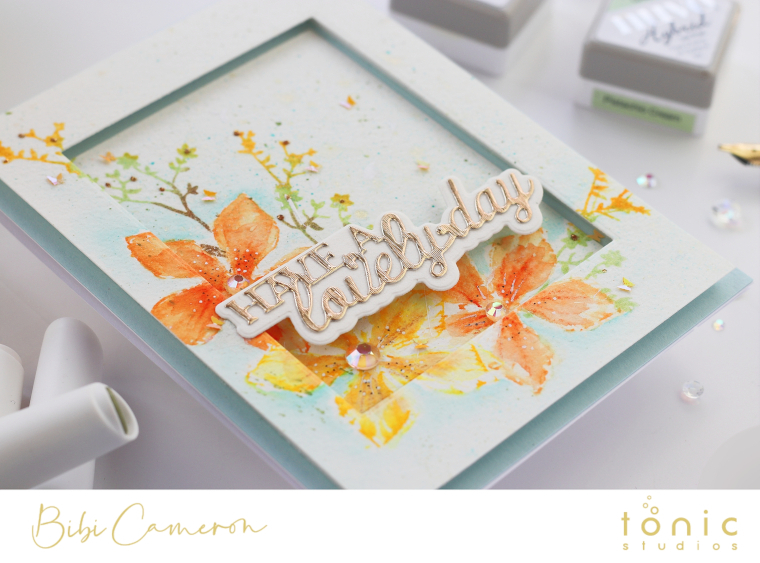 So this card has loads and loads of easy to apply details and I want to share the cardmaking process with you in a 7 minutes -video. As a bonus, I also made an envelope using the beautiful Yellow Bamboo speciality paper from Woodland Walk Colour Collection. You might be wondering why Tonic releases are not simultaneous on both sides of the world? I realised that this is due to the way Tonic has been operating for almost 2 decades. Tonic used to sell products through retailers "only", they didn't have an online shop with direct sales to customers. However, as the demand for Tonic products increases the company have decided to open for the very first time their online shops last month ( March 2019). Now, you, me and everyone can buy directly from Tonic with access to great promotions and discounts and you can still buy Tonic from your favourite shops as well. Tonic operations in the USA and UK also have a demand for different products. While Nuvo colouring tools are in high demand in the USA, the UK operation has been focused on promoting the die cutting industry so the warehouses in both countries stock different items. I noticed that there are not many dies in the USA and that the new Nuvo releases are always a priority in the USA. Actually, at CHA (Creativation - USA craft trade fair ) people can get to know the trends for the whole year round. BTW, Tonic is a 100% British company. All Tonic products are created by British engineers and designers in the home office in Wales, UK. When Mark Donavan, designer of Tonic dies and head of the design department in Wales told me they have more than 6K dies designs I almost fainted!!! That's too much for my crafty soul! I make jokes with Owain Roberts (Tonic's Marketing Manager) when I say that British people are eccentric. Tonic is innovating and creating new tools for papercraft lovers all the time... it is seriously insane!! So there is a reason behind everything and many Tonic fans know how things work at the moment. Many new people in the crafty community have a lot of questions. For now, you can explore Woodland Walk new colour collection. Check out irresistible promos available over the Tonic Studios USA Shop and Tonic Studios UK shop.